If you are a fishing lover, you ought to know that there are Kayaks available in the market of different size, different weight, different length, different width and different design. Those days are bygones when we used to consider inflatable fishing kayak to be pool tools! Usually used in the fast-moving water situations, Self-bailing kayaks have so many holes or ports which are located in the base of the kayak. As these are the kayak for rapid moving water, those holes help the water to enter inside the kayak and then pass back out and in this way, it ensures that the boat does not get filled up with water. Sit inside kayaks are more likely to the traditional kayak design which has a cockpit that is enclosed. This kayak keeps water out of the boat when the weather is cold. Apart from these inflatable kayak styles, there are also so many kayaks namely Canoe-style inflatable kayak, Standup Paddle Board Inflatable Kayak, Open-style inflatable kayak, tracking fin inflatable kayak, fish-tailing inflatable kayak etc. Why will we even choose Inflatable kayak? Check out this segment to know more! Inflatable kayaks are portable. You can easily take it and wrap it inside the back of your car when you are moving to remote areas. So, having fun far from your city or country is not more boring. Because water adventures are easy with inflatable kayaks. They solve your storage problems in a minute. Though inflatable kayak can hold one paddler up to two to three paddlers, these are really lightweight when we talk about the heaviness. So, no matter one, two or three, how many people are up for adventure with an inflatable kayak, the lightweight makes it easy to transport and bear in far-flung areas. Most of the inflatable kayaks are strong and incredibly stable. So many beginners get nervous when they do kayaking but as these kayaks are very much stable, you have fewer possibilities of falling down in the water. Moreover, for being sturdy, inflatable kayaks are not usually seen getting punctured in midway. If you inflatable kayak is punctured, you can go for repairing and usually these sort of kayaks are easily repaired. Yes, inflatable kayaks are safe as they are rigid, well-built, and more proficient of crossing any lake, speedy rivers and are sturdy and stable. Is inflatable kayak good for fishing? Inflatable kayaks are not considered too much good in fishing. 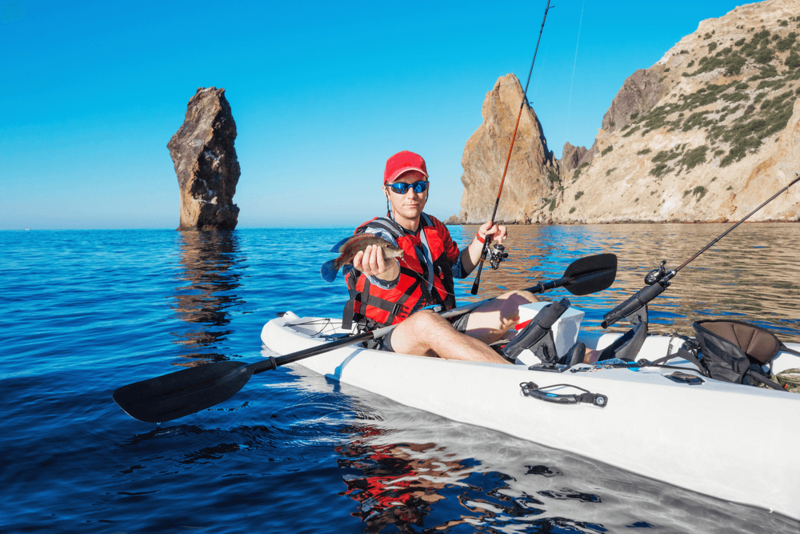 But if you are interested in using inflatable kayaks in fishing then do not settle on any cheap kayaks rather go for any leading branded inflatable kayak that can provide good performance. Can you use inflatable kayak on the ocean? It is safer not to use the inflatable kayak in the ocean. But if you love doing kayaking with inflatable kayak then you can select inflatable kayaks that are prepared for the ocean. Yes, there are inflatable kayaks available that are only made for the ocean. Inflatable Kayaks that are available in the market consist of aluminum or plywood sheets that are fixed in between Kayak’s tubes. In the very middle of 1839, Duke of Wellington first tested inflatable pontoons. You will be amazed that the great Titanic was an inflatable boat and the idea of those inflatable boats later was exercised in the making of the modern inflatable kayaks. With the help of technology, the inflatable kayak of these days concludes everything that a family needs in their recreational fun along with the hi-tech expert watercraft. Great info about inflatable fishing kayaks. thanks for sharing!